The Tri-Faith Initiative(TFI) is made up of three Abrahamic faith groups who have chosen to establish a faith-based campus together that is committed to practicing respect, acceptance and trust. The three communities are of the Jewish, Christian, and Islamic faiths: Temple Israel, Countryside Community Church and The American Muslim Institute. 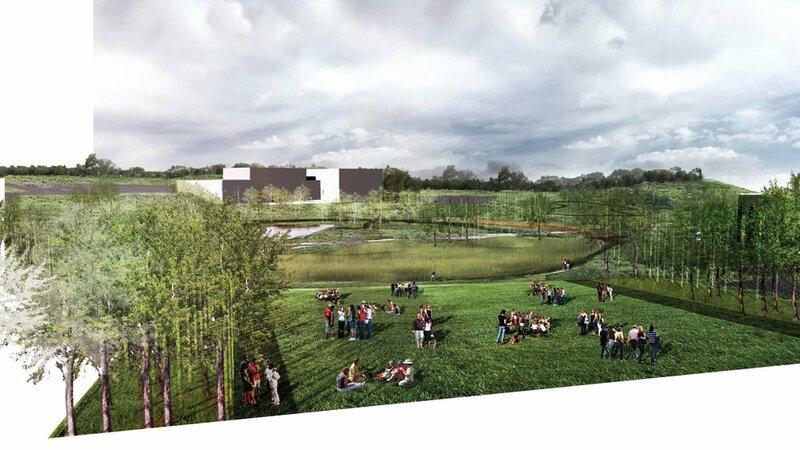 The 32-acre sustainable campus is being planned on the previous site of Omaha’s only Jewish country club. 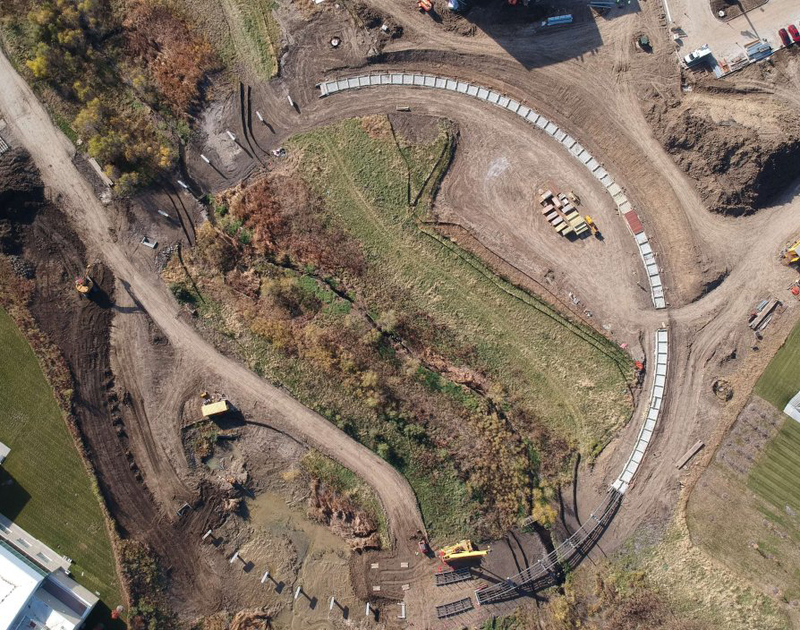 Following the close of the country club, the site was sold to a developer and underwent a huge site restoration by the Army Corps of Engineers, restoring the existing Hell Creek and adjacent flood plain. The Tri-Faith Campus design is rooted in common Abrahamic values shared across the three-faiths such as the sacred role of water, the belief about God, and the role of prayer and worship. These values are brought together and shared through a series of large and small-scaled moves in the design. Each faith building and the Future Tri-Faith Center are brought together in the landscape by a large circular path and series of bridges that cross over Hell Creek. The buildings are connected to one another and to the site in an equal, all-encompassing and singular way. The secondary walks, faith-based gardens, range of gathering spaces and plantings are grounded in ambitions of stewardship of the land, ecological restoration and filtration of water. Each feature embedded in the landscape has been considered as part of the larger whole - as sacred, animated through orientation (qibla direction, rising sun, and the ancient Near East) and able to register changes over time. When complete, the Tri Faith Campus will be the first destination in the world to unite Christian, Jewish and Muslim faiths on a collective campus. The design team worked closely with the client groups and stakeholders, facilitating a series of visioning workshops to ground the campus planning in the organizational mission of both the TFI and the individual faiths. The biggest opportunity for the design team was to embed values of the organization in the campus and translate the TFI mission into a legible, powerful and physical place-based experience. The design team created a place that is at once a home for the three faiths and residents of Omaha while anticipating millions of international pilgrims drawn by this landscape for learning, fellowship and beauty. 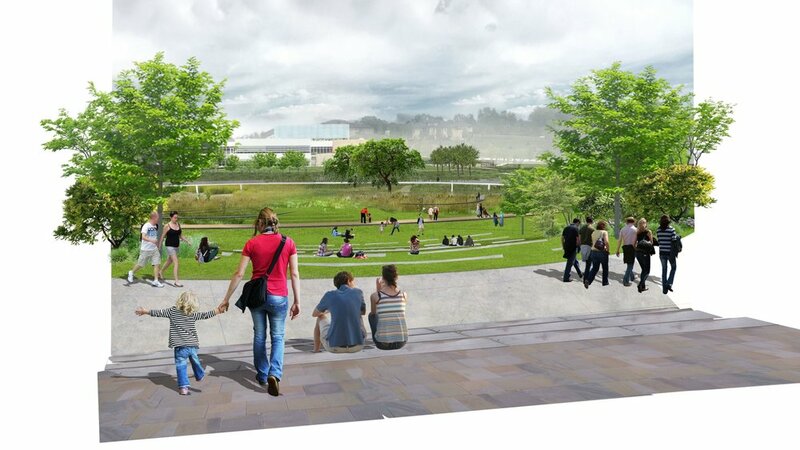 The campus project is just beginning schematic design with construction beginning fall of 2017.